With curfews imposed in the Nusaybin district of Mardin and the Yüksekova district of Hakkari province that went into effect today, the government kicked off extensive operations against the PKK terrorist organization, which will reportedly include nearly 20,000 security officers. Having swept out all PKK terrorists in four districts in the region since mid-December, the focus of the current counterterror operations will be on Nusaybin and Yüksekova. A written statement from the Hakkari governorate said a curfew was imposed in Yüksekova that went into effect on March 13 at 10 p.m. Mardin's Nusaybin district will also be under a curfew that took effect after midnight, according to a statement from the governorate. The curfews were imposed "due to escalating terror activity in the region" and to ensure the "security of citizens' lives and property," the statements added. Both districts were previously placed under curfew late last year. Counterterror operations were recently completed in other southeastern districts, such as Cizre, Silopi and İdil in Şırnak province and Silvan and Sur in Diyarbakır. Operations will also be carried out along Turkey's borders with Iraq and Iran, new for the operations because those since mid-December were launched in districts in the centers of provinces. Special operations team officers will reportedly lead the operations, as the PKK plans to gather all its manpower to wage total war in the spring. While the PKK is speaking of a tough spring with total war in urban areas, the government has reportedly consolidated measures in the region. A total of 1,220 terrorists have been killed since early December during the longest-runningcounterterrorism operation in southeastern Turkey, according to figures released on Friday by the Turkish Armed Forces (TSK). 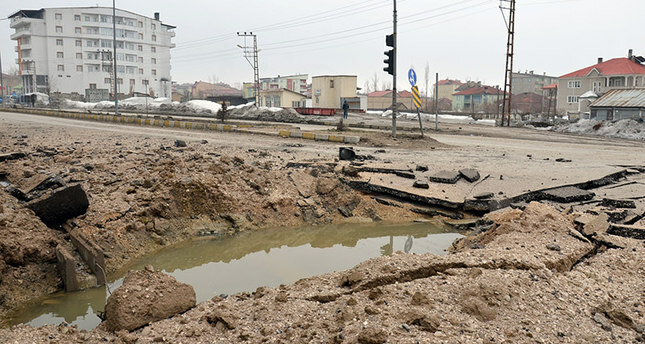 Security forces filled in and removed 2,287 ditches and barricades during the operations – 22 in Silvan, 243 in Sur, 971 in Cizre, 263 in İdil and 788 in Silopi. Turkish airstrikes in northern Iraq killed 67 PKK terrorists, a military source said Saturday. Fourteen F-16 and F-4 jets carried out raids on the positions of the PKK terror organization in Qandil, Metina, Haftanin and Avasin-Basyan on March 9, the source said on condition of anonymity, due to restrictions on speaking to the media. Shelters, caves and gun emplacements were destroyed. The Turkish Air Force has been conducting strikes on PKK bases in Iraq since July when the PKK – listed as a terrorist organization also by the U.S. and EU – resumed its 30-year armed campaign against the Turkish state. The PKK terrorist organization recently joined forces with eight other terrorist groups to form a new alliance called the "Peoples' United Revolution Movement" (HBDH). The nine terrorist groups have reportedly been attempting to find common ground. The formation of the new alliance was announced during a meeting in the Qandil Mountains. During the meeting that included PKK leaders, Turkey was cited multiple times and declared as a common enemy.